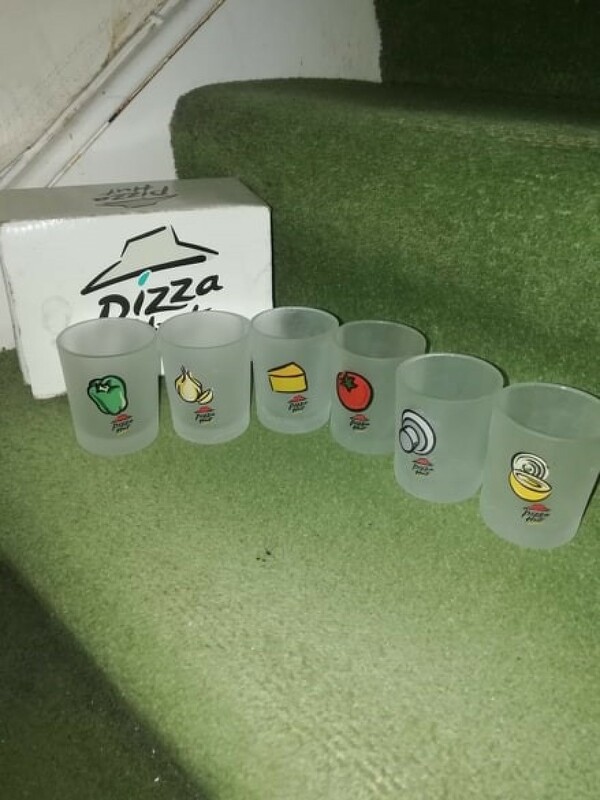 I have this set of very old unused Pizza Hut glasses and cannot find anything like it mentioned on the internet. As they appear to be rare does anybody know if they have any value? I dont see the exact one on eBay, but the glasses in general from there seem to be going for $10 each. 1. Call the Pizza Hut Headquarters in TX and ask what year they are from and if they have a name: (972) 338-7700 and maybe they will then come up in a Google search. I am shocked that in my kit bag of research tools they did not show up. I am usually very good about identifying most things old, especially advertising items. 2. Thought 2 is that it was created for a franchise and there just aren't any up for grabs at the moment, not because they are rare, but just because of timing. 3. If you are trying to sell them without knowing the "value" I can tell you what I would do if these were mine. I decide how much I want for them, then I put the item on eBay with a reserve auction for that "value" and see if someone pays it. I would try a 7 day auction and start low (like 9.99), then see where the price goes. If it hits the "reserve" it sells, if it doesn't, you have the option to sell at the highest bid or try again with a new reserve. You will get charge a fee for these kind of auctions, which is the downside, but it is worth it to test the market. The market dictates value these days--value = what someone will pay for an item. A book can say something is worth a million dollars, but if no one is willing to pay that, then the value is ZERO! If you don't have a comparable item to help guide you, then you have to just let the market decide today's market value. There are people who love, love, love advertising items and if something unusual comes up, they may want to pay more than something run of the mill! I hope that is what you have! One last tip, with something so fragile, you are best to wrap these in bubble wrap, then put each bubble wrapped glass in a cardboard sleeve--like light bulbs come in and then wrap bubble wrap, air pillows or packing peanuts between each glass pack. I have been having major issues with the USPS breaking things and the worst thing for this auction would be someone paying bucks and getting a box of shards. Be sure to ship it priority and insure it AND before you even complete the auction, do the wrapping and weigh the box so you don't get cheated in the postage (you may have to switch over to the 'advanced seller' feature to do this, but it is the only way to get it right where you enter the box size and ACTUAL box weight. I can guarantee you if you let eBay calculate the weight, it will be totally WRONG and WAY UNDER the actual price. Looking forward to hearing how it shakes out for you. Post back with an update! You have kept them in such great shape. I would not give them away too cheap. These would look great in anyone's house! Since this set seems to difficult to find, why not ask for a free appraisal - maybe they can tell you something about this set. You will need several pictures and also size of glasses (ounces? measurements?). Ask on several sites as you may not receive the same information from each site.